#1038 Display Cabinet Hardware is used for both plans and includes non-mortise hinges, key plate and lock, shelf supports, embossed oak ornament, and a cabinet light with bulb. The project plan, glass, wood, and wood finish are not included. 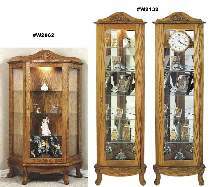 Plan #W2062 is 56"H x 33"W x 15"D. Plan #W2132 is 72"H x 21"W x 14"D. Order optional #1178 Clock Hardware separately for Corner Display Cabinet. The #1048 Special includes #W2062 56" Cabinet Plan and #1038 Hardware. The #1141 Special includes #W2132 Corner Display Cabinet Plan and #1038 Hardware.